One customarily speaks of "national" choral styles. Perhaps the best-known of these is that found in the Russian Orthodox Church, in which the altos and especially the basses predominate. However, one also finds an "English cathedral" sound – readily identifiable in the King's College Choir and analogous to the "wood" stops of an organ – and a German. The United States, as one might expect, amalgamates several different styles, including its own vernacular ones. For some reason, one tends to forget the Scandinavian, particularly Sweden and Denmark, to me one of the most vital choral traditions. The characteristic sound is clear and more light than rich and emphasizes keeping in tune. Furthermore, the tradition constantly renews itself by committing to new, contemporary, "difficult" repertoire. In the United States, we tend to think of choral pieces as the stuff of amateurs, which implies "easy" and "dumbed down." Much of the choral market here indeed caters to amateurs. Our great composers – with notable exceptions – don't write for chorus as they would for instrumentalists. In Europe, on the other hand, and particularly in Scandinavia, a composer's major work might well include pieces for a cappella choir, although it doesn't preclude works for amateurs. Britten writes "Friday Afternoons" for school children as well as the fantastically difficult "a Boy Was Born" and "Hymn to St. Cecilia," two works which furthermore very strongly resemble the instrumental music Britten composed at the time. The Scandinavian influence, particularly in the United States and Canada, has spread surprisingly widely. Minnesota, with its large ethnic distribution of Swedes and Norwegians, boasts both the St. Olaf Choir and the Dale Warland Singers, the former particularly influential throughout the Midwest. The province of Alberta also saw its share of Scandinavians, historically wheat growers in the New World. Pro Coro Canada hails from Alberta. Founded by Michel Gervais, under the Swede Erik Westberg's direction, it definitely became part of the Scandinavian choral tradition. The sound comes closer than, say, that of the Dale Warland Singers (who, like just about every other U.S. ensemble, was at least touched by the Robert Shaw Chorale) to the première groups of northern Europe – chiefly, the Swedish Radio Choir and the Danish Radio Choir. Pro Coro Canada is "a professional choral ensemble," which is a little like saying "an amateur gunslinger." Usually, neither survives for very long. The economic landscape is just too hostile. Still, while they're with us, I recommend you enjoy them. 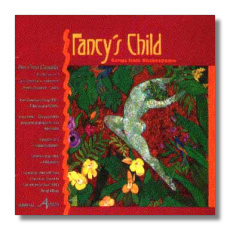 The earlier recording, Fancy's Child, deals with settings of Shakespearean lyrics. Vaughan Williams' Three Shakespeare Songs come from relatively late in the composer's career (1951), after his harmonic language had expanded to include a very personal tonal chromaticism, as opposed to the modal flavoring one usually associates with this composer. The "odd" chords consist mainly of augmented triads, sometimes with extra notes. A choir strains to keep these chords in tune, and even in tune, they sound slightly "out." It reminds me of a pungent cheese softening and ripening. Vaughan Williams stands out as a setter of great poetry. Furthermore, he seldom chooses the obvious text. His Serenade to Music, for example, set the Belmont scene from Shakespeare's Merchant of Venice. In these Shakespeare songs, he takes two lyrics – "Full fathom five" (The Tempest) and "Over hill, over dale" (Midsummer Night's Dream) – and part of Prospero's great "The cloud-capp'd towers" speech (The Tempest). The thread running through all these texts is night and dreams – rather Brittenish, actually. The spongy harmony suits the text. In "Full fathom five," we seem to hear underwater the tolling of bells rung by sea nymphs. "Over hill, over dale" describes Puck's flight – light but driven by the rhythm of the opening lines. "The cloud-capp'd towers" plays like the joker in the pack. Vaughan Williams sets the other two pictorially. Here, he comes up with something sublime, like a Friedrich landscape, as he and Shakespeare sing of the "insubstantial pageant" of the world. "We are such stuff as dreams are made on, and our little life is rounded with a sleep." He ends with the same major-minor harmonic progression, dying to nothing, that closes his sixth symphony, and in fact admitted – pressed with a well-meaning interpretation which turned that symphonic epilogue into a vision of nuclear holocaust – that this passage had been on his mind. Pro Coro Canada does well, especially with intonation and diction. Stephen Layton's Holst Singers (Hyperion CDA66777) do better in some ways, worse in others. In "Full fathom five" the Holst Singers better realize the variety of tone and texture of Vaughan Williams' choral writing. On the other hand, you strain to understand the words, often a sign of squishy rhythm. "Over hill, over dale" flies by in a blur, and "The cloud-capp'd towers" fails to reach Pro Coro's height, simply because you actually hear the text. There's not much to choose between the two ensembles' intonation and tone. The Holst Singers sound more in tune, especially in "The cloud-capp'd towers," but it doesn't contribute decisively to the performance, which communicates less than Pro Coro's. The Swiss composer Frank Martin (pronounced "Mar-TAN") wrote in a vein similar to his compatriot Arthur Honegger. However, despite a wonderful catalogue, he has never really "broken through" to general awareness. He is usually more restrained than Honegger, and this may be part of the trouble: there's no ear-catching pyrotechnics like "Pacific 231" or "Jeanne d'Arc au bucher." However, if you like the elegant expression of powerful emotion, give Martin a try. I recommend his Violin Concerto, Cello Concerto, Harpsichord Concerto, the ballet "House of Garcia Lorca (Blood Wedding)," Mass for 2 4-Part Choirs, the massive oratorios "In terra pax" and "Golgotha," the Études for Strings, Concerto for 7 Wind Instruments, Wind Quintet, Trumpet, Trombone, Percussion, and Strings, the Petite Symphonie Concertante, and the Symphonie concertante. Ansermet and Paul Sacher championed his music. Shakespeare's Tempest apparently fascinated Martin. In addition to these choral pieces, there's a full-length opera ("Der Sturm"). In the "Songs of Ariel," Martin also sets "Full fathom five," and the differences between this and the Vaughan Williams are instructive. Vaughan Williams uses harmony as strokes of color and an elaborate, shifting texture. Martin's harmonies are more wiry and more functional. His counterpoint is also leaner, at times stripping down to simple two-strand contrast. The bell-tolling of the sea nymphs is effectively handled by moving the ringing through all the voices, one voice at a time. Martin's lean choral writing place even greater strain on choral pitch. Swedish choral legend Eric Ericson, of the Swedish Radio Choir, takes over from Westberg for these pieces. The choir bears down, particularly in the extended, taxing "You are three men of sin" and end up as strong and fresh in tone as they began. Sven-Eric Johanson is a name new to me. The liner notes claim a personal adaptation of 12-tone technique, but I have a difficult time hearing that in "Fancies I," for choir and piano. To me, it owes far more harmonically to late Debussy – quartal harmonies mixed with Impressionist 7ths and 9ths, and a touch of the old church modes. The songs are pleasant and the choir does well, but this choir is capable of far more ambitious repertoire. I, for one, would have them spend their time on something harder. Nils Lindberg's "O Mistress Mine" – which throws in the Campion "ringer" of "Cherry-Ripe" among the Shakespearean "O mistress mine" and "Shall I compare thee to a summer's day" – is similar harmonically but to me far more musically substantive. The triptych challenges the choir with rich harmony at slow tempo, which would flatten a lesser choir's pitch. Pro Coro Canada loses only a few barely-noticeable cents, and I admit the only way I could tell was by replaying the beginning immediately afterwards. The songs themselves are gorgeous. Lindberg sets the text with a sensitivity matched by few native English speakers. Eric Ericson returns for Bengt Hallberg's unusually-named Concerto for Piano and Mixed Chorus. I first encountered Hallberg's music in a performance by the Swedish Radio Choir. Hallberg began, at least, as a jazz musician, and rhythm (though not jazz rhythms, oddly enough) figures prominently in his classical work. At his best, he whips up a fine excitement through his rhythms. The pieces I've heard have been bounding good fun. The work in some sense cracks an inside joke. This work isn't a concerto in the normal sense. It seems to refer to the piano part, more strenuous than usual for choral accompaniment (though nowhere near, say, Ravel in difficulty), and as such pits chorus against instrument at roughly equal strength of musical interest. Unfortunately, the performance doesn't come off, due mainly, I believe, to an improper recording balance. The piano dominates so that you can't really hear the chorus. Further, the chorus has trouble cleanly articulating the rhythms. I suspect that a smaller group of perhaps twelve, pushed forward in the balance, would make a greater effect. 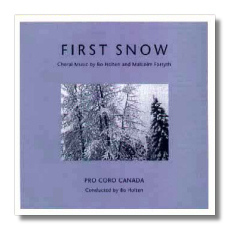 The album First Snow finds Pro Coro Canada at least a year older and led by yet another Scandinavian, the Danish composer Bo Holten. The choir's sound has become even stronger, without losing its old virtues of clarity and spot-on intonation, and the choir itself performs with even greater assurance. It has become a first-class ensemble. The program overall demands more technique than the earlier CD, and the chorus doesn't disappoint. The composers are Holten and Malcolm Forsyth, a South African transplanted to Canada. Both have extensive catalogues, including large-scale instrumental works, and it shows in their choral work. Most choral compositions derive their structure from that of their texts. To take a simple example: you can usually time the total length of a piece to three-stanza text by multiplying the duration of the first stanza by three. However, composers can play the more difficult game of shaping the text to a musical, usually symphonic form. One thinks of Brahms' Schicksalslied, Mahler's Das klagende Lied, Parry's Blest Pair of Sirens, Vaughan Williams' Sea Symphony, Schoenberg's Gurrelieder, Bartók's Cantata profana, and Stravinsky's Symphony of Psalms. Holten and Forsyth usually do the second. Many of the works on this program run longer than the usual two or three minutes. Three run more than nine, and all show the composers' experience with large instrumental structures. Forsyth writes more "instrumentally" than Holten for the choir, in terms of the rhythms and the vocal agility they require (especially in the Donne cycle), but none of it lies beyond a singer's reach. The Holten works here favor slow tempi and rich, sustained tones. In Snow and Peak's "First Snow," he creates from these basic procedures a tremendously beautiful musical depiction of snow falling lightly, steadily, and peacefully until it blankets everything in white. In the nearly ten-minute "Night" (from The Marriage of Heaven and Hell, a six-movement suite! ), Holten divides the choir into twelve parts, mostly to achieve chord clusters, and paints the neuron fires that become dreams and nightmares. The "events" of the piece occur in a way that mimics the dream state itself – a background buzz against which actors and objects suddenly stand in relief and melt into other things by visual pun, rather than by cause. It sounds relatively simple, but it requires great stamina, at least, from the singers, for it's much harder to sing softer than louder. Conductor Holten and the choir keep the energy in all this, never allowing the music to melt into goo. I find Forsyth's Three Love Poems of John Donne the most interesting work in the program. Donne's poetry very seldom creates a sustained mood, something music needs to establish. It jumps around both in its imagery and in its tone. The composer must frame these without doing violence to the text. Forsyth solves the problem by writing musical lines just as quirky and by making his quirkiness consistent throughout. He convinces us that all of Donne is of a piece, rather than in pieces. The singers attack their parts fearlessly, even enthusiastically. You take the accuracy for granted. That's the mark of a very good choir indeed.